You are currently browsing the tag archive for the ‘Power BI’ tag. As we’ve seen in the previous articles on How to work with Power BI in Dynamics 365 for Sales and Service as well as How to work with Power BI in Dynamics 365 for Sales and Service–Part 2, we can leverage the existing content packs to simplify our data presentation for the Sales and Service modules in Dynamics 365. And that works fine if your requirements conform to what’s already built in those content packs. But most of the time that’s not necessarily the case. Let’s have a look at how you can work with Dynamics 365 Customer Engagement data in Power BI from scratch. We’re going to be doing this from Power BI desktop. If you don’t have it installed on your machine, grab it from the Microsoft Store or from here. As we’ve seen in the previous post, getting content from Dynamics 365 for Sales or Service into Power BI is a relatively easy task when leveraging the Content Packs created by the great guys at the Power BI team. Now, with the content packs in place, let’s go back to our Dynamics 365 instance and bring the data with a nice lipstick on. First off, you must enable Power BI visualizations. Go to Settings > Administration. 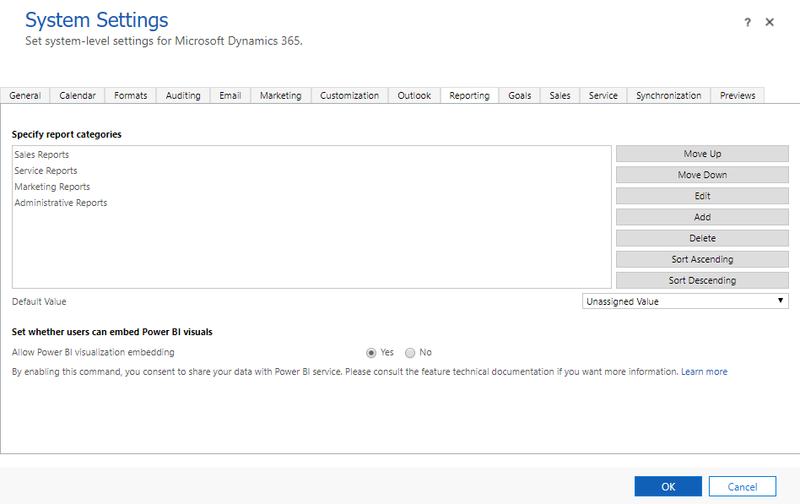 Here open System Settings and on the Reporting tab, enable Power BI visuals.